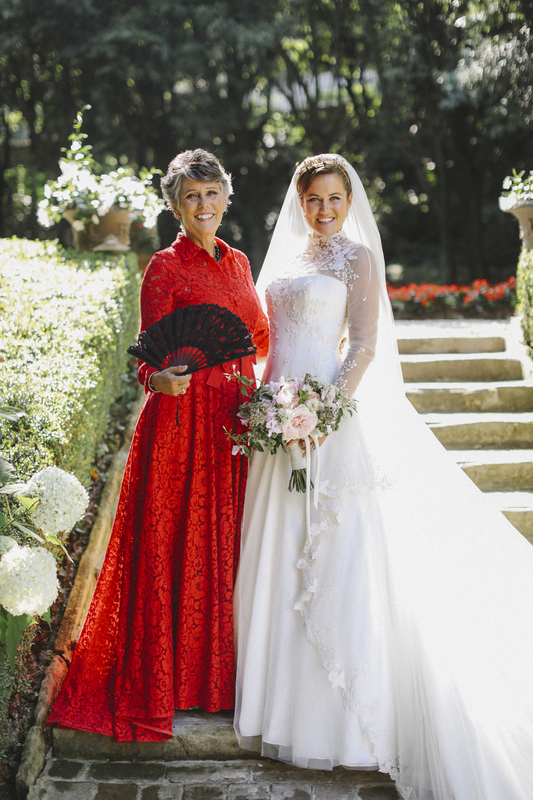 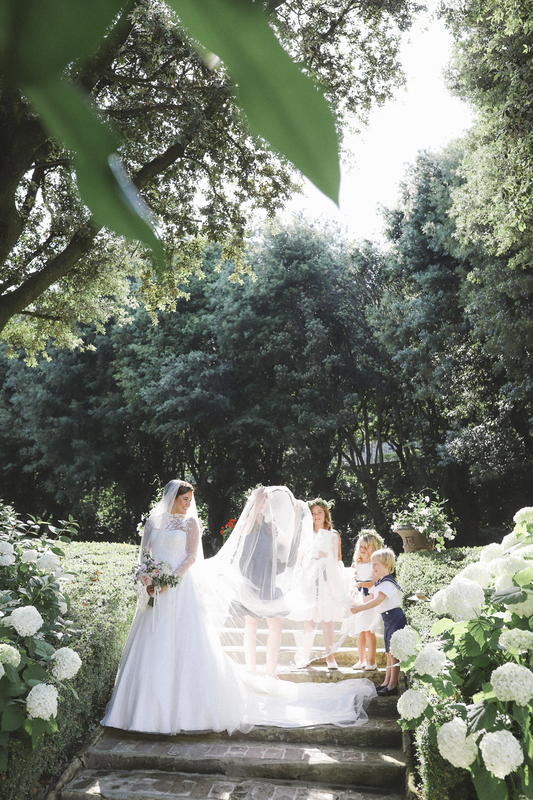 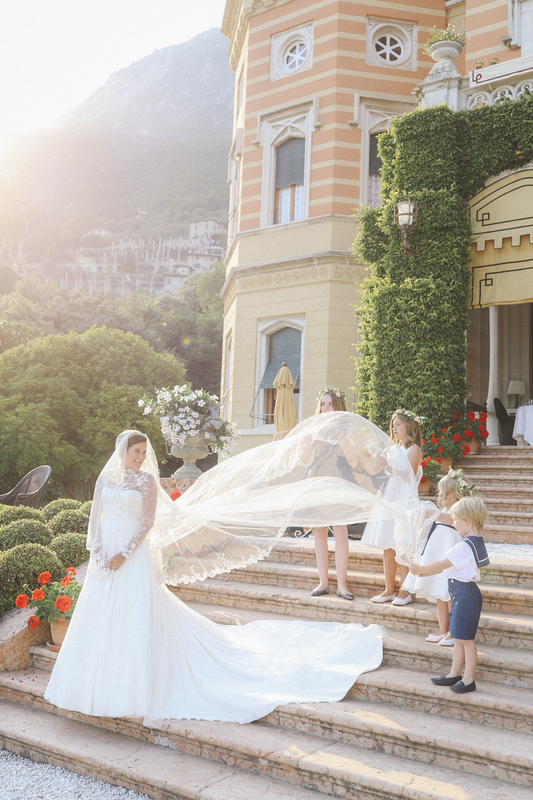 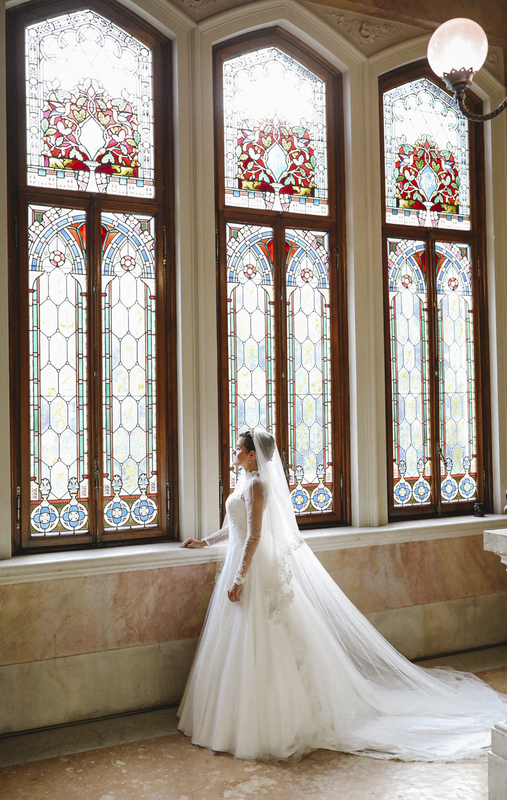 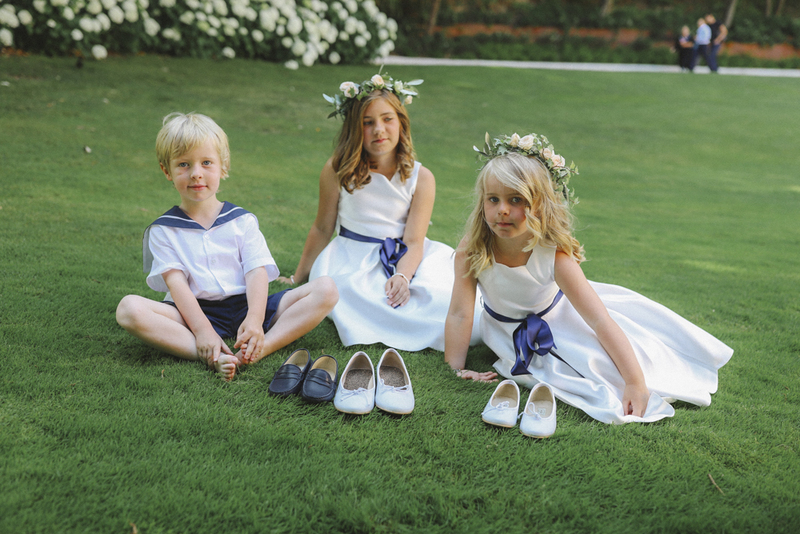 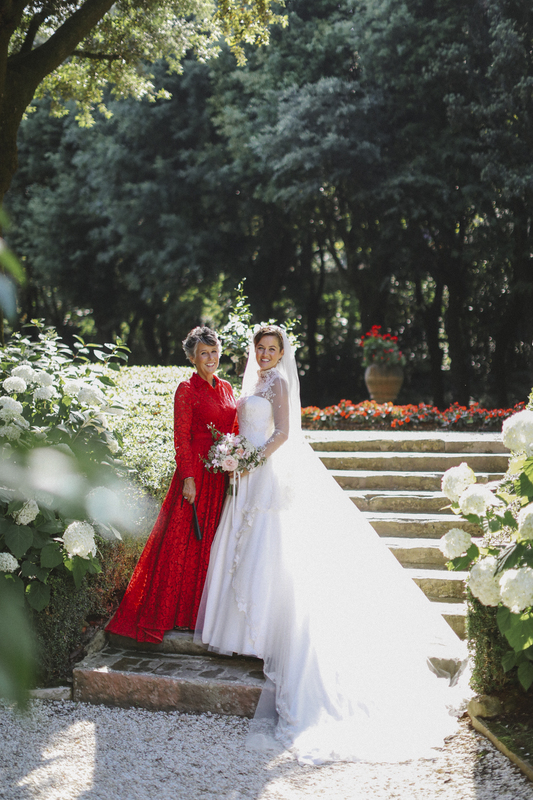 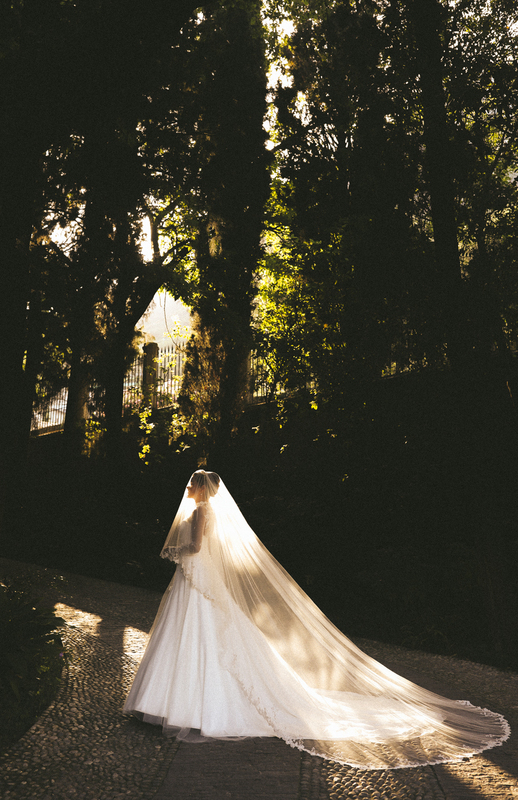 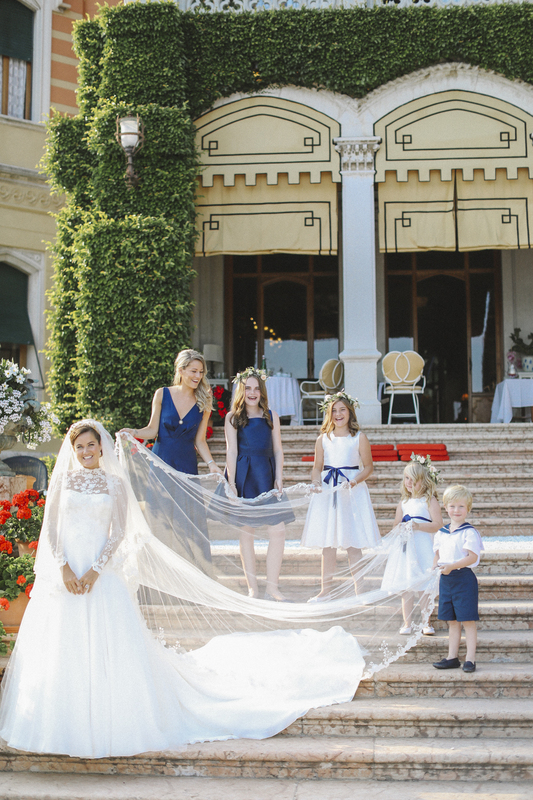 For Rosie’s Lake Garda wedding Phillipa designed a bespoke fairytale dress. 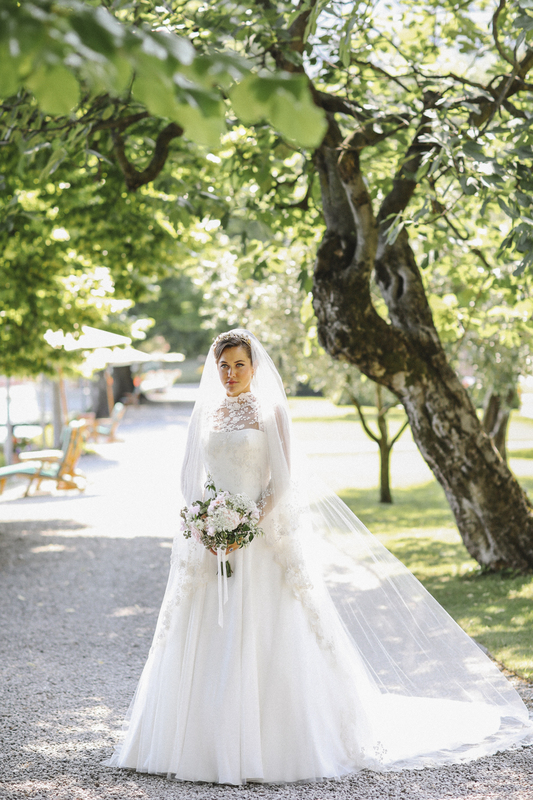 Made of the finest Italian silks – layers of slipper satin, billowing, light satin chiffon and a hand embroidered fine tulle overlay – Rosie’s dress also had our signature Phillipa Lepley corset hidden beneath. 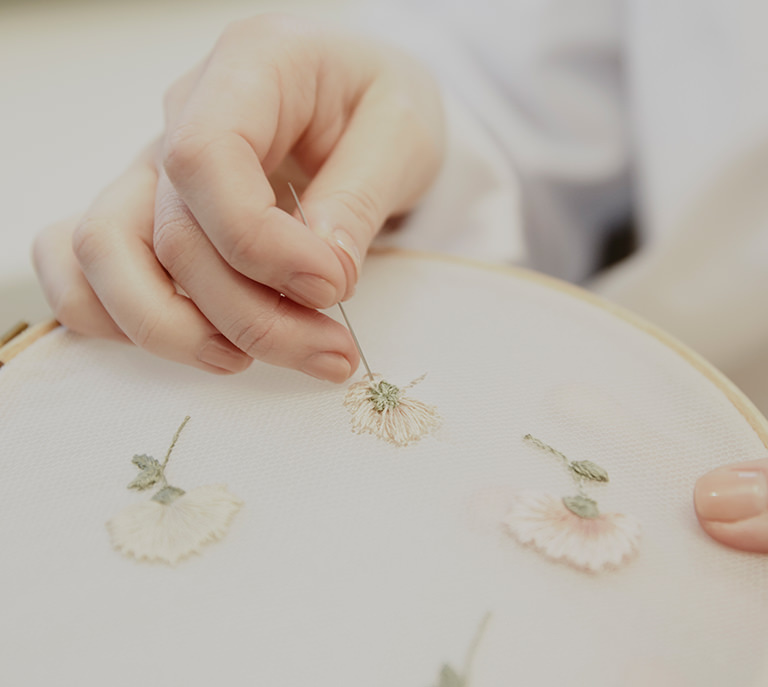 The embroidery was developed with Rosie to include primroses, maidenshair fern and – of course – roses! 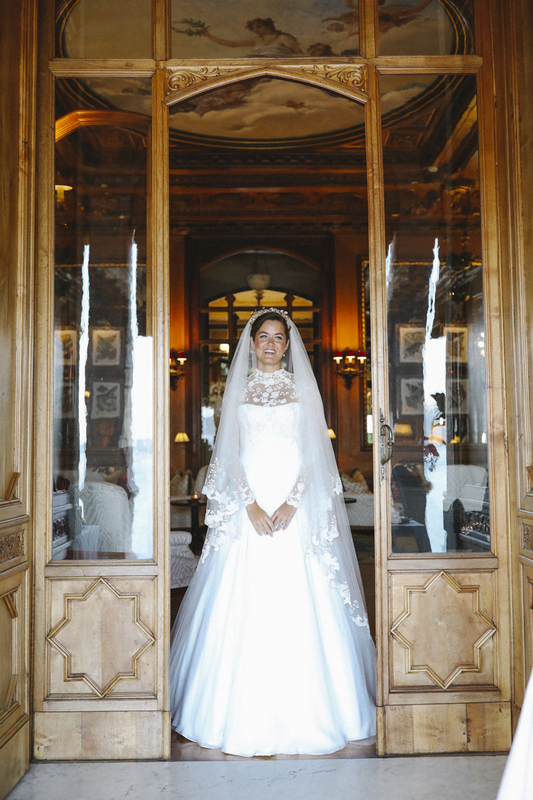 With the embroidery designed in house, our team have the ability to create unique embroidery personal to the bride. 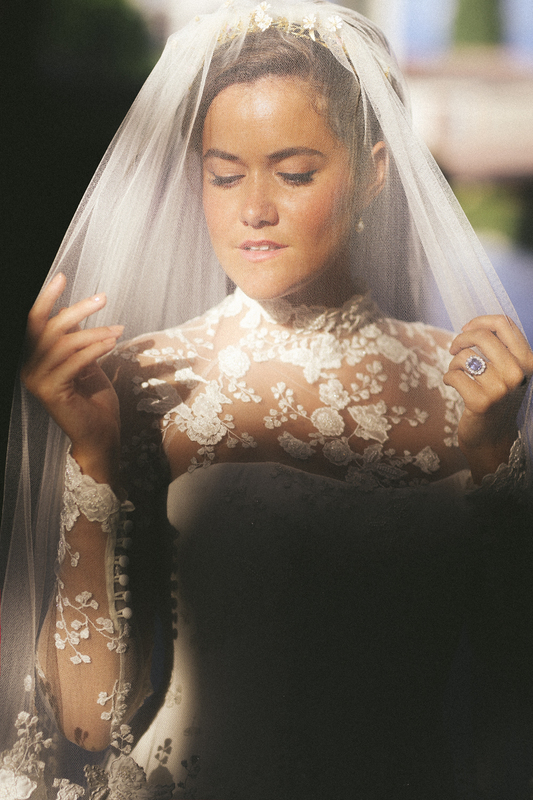 For Rosie’s dress, many different hand embroidery techniques were brought together to create a luxurious and sumptuous finish, further enhanced with thousands of crystal and pearl beads applied by hand. 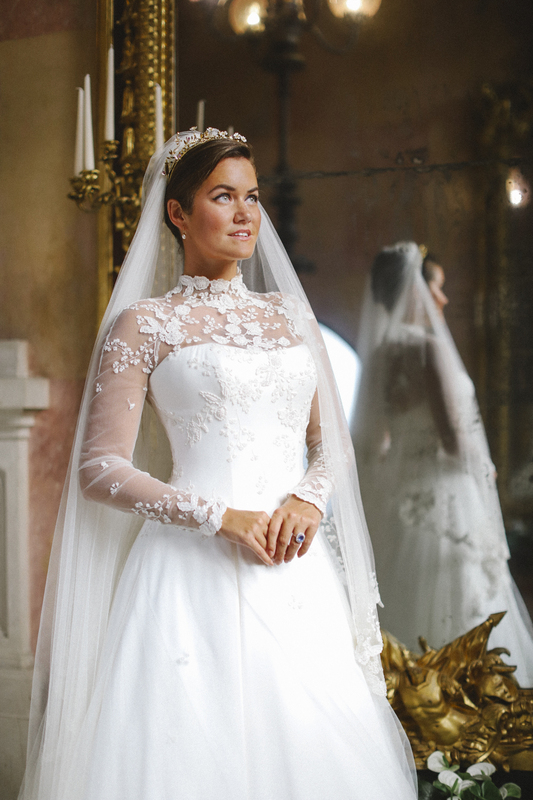 The high neck and long sleeves offer an air of regality to Rosie’s look whilst the placement of the embroidery kept the look soft and feminine. 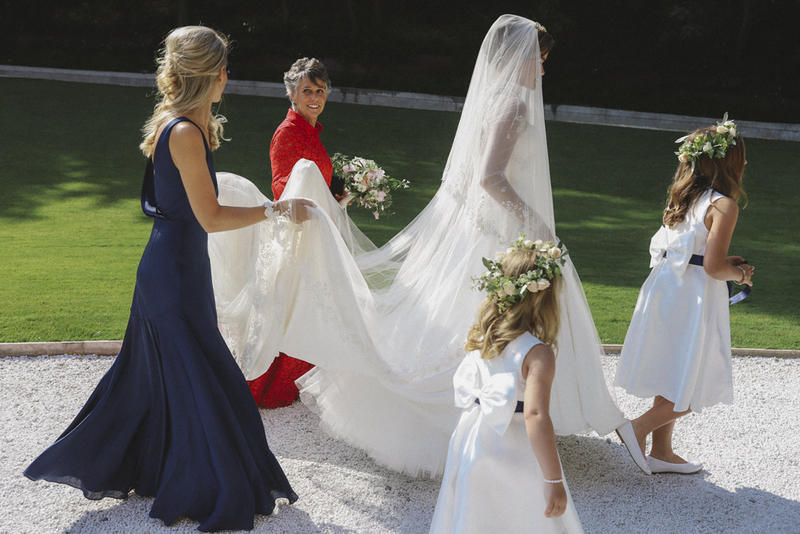 Each motif was carefully mapped out and positioned on Rosie: petals wove their way up from the cuffs of the dress and trickled organically from the high neckline, as if gently scattered over the bodice and down the skirt. 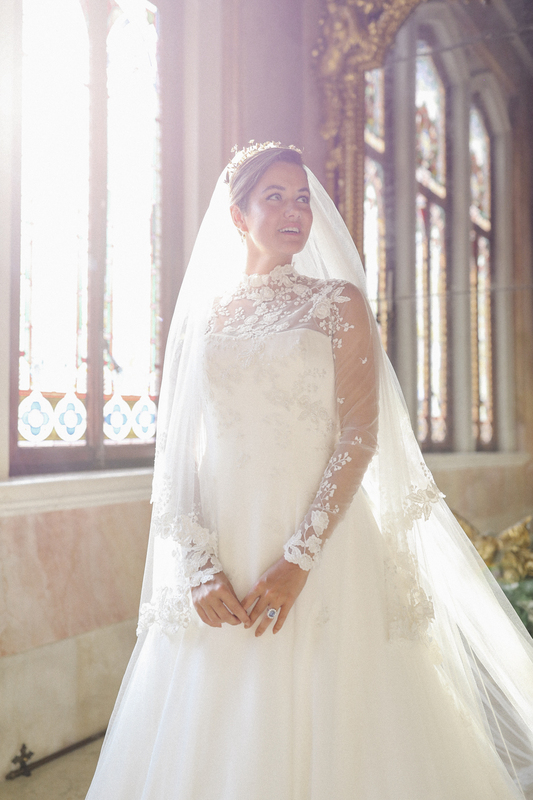 Rosie’s cathedral length veil was created in the finest silk tulle and delicately edged in co-ordinating embroidery to work with her chosen headdress and compliment her dress. 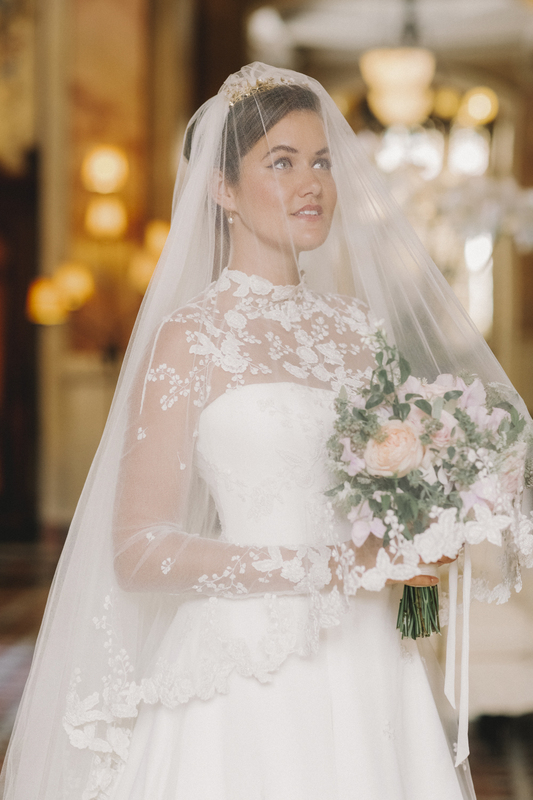 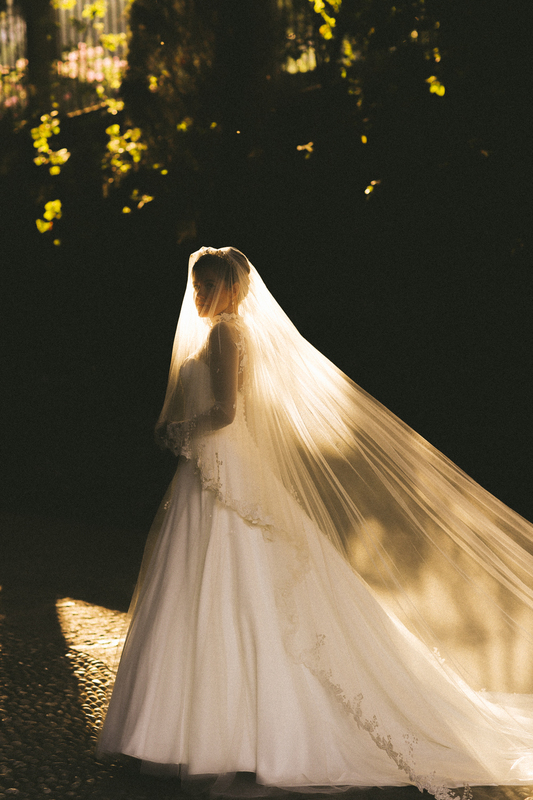 Phillipa designed Rosie’s veil to be an integral part of her overall look with a focus on the opulence of layer upon layer of silk, tulle, embroidery and embellishment. 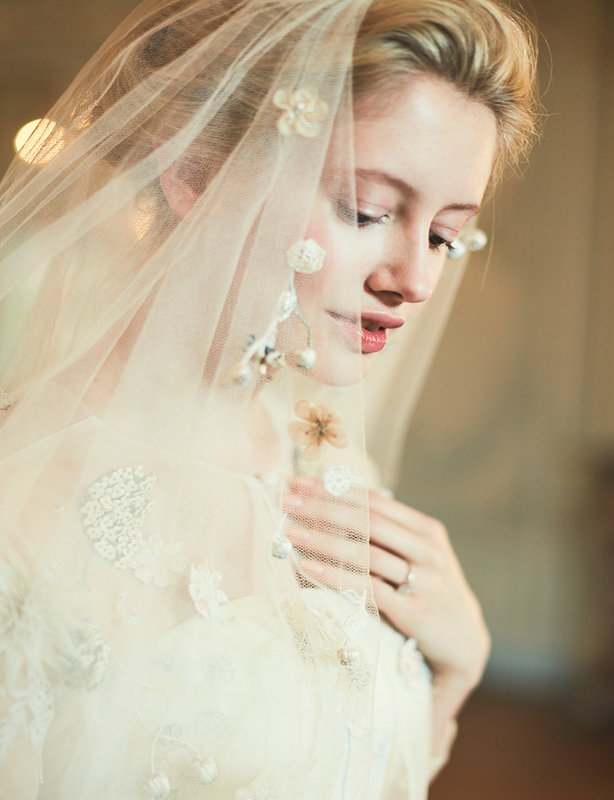 With a Couture Phillipa Lepley creation, every element is meticulously planned so that each layer enhances the one beneath and above to create one cohesive, couture look. 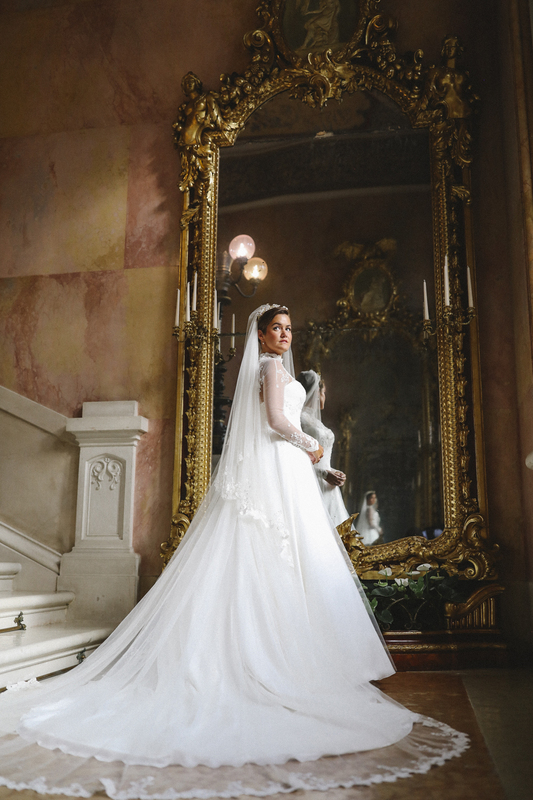 Phillipa Lepley is widely recognised as being the leading British couture wedding dress designer. 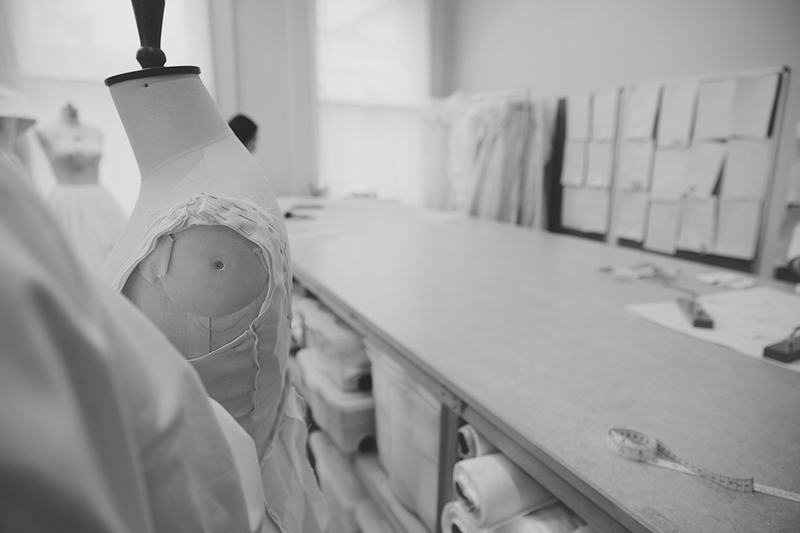 Her wedding dress shop in London, Chelsea, has over 50 dresses all of which have been made in England from start to finish at her atelier. 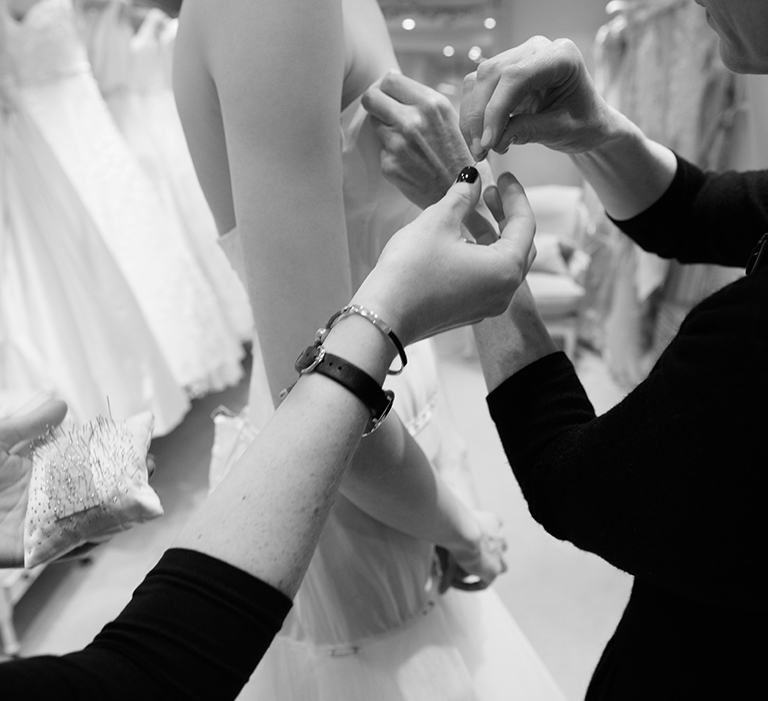 To make an appointment to view the collection please click here, call 0207 590 9771 or email info@phillipalepley.com.